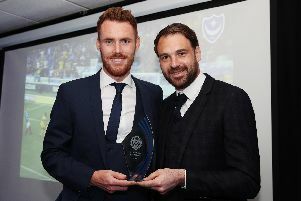 They played for three different clubs together, switched from non-league to the professional ranks in the same month and clinched League Two winner's medals at the same club. But on Saturday, they'll do battle on opposite teams for the first time. Pompey make the short trip to the Hawks on Saturday(12.30pm) and it means Jamal Lowe and Nicke Kabamba will go head-to-head. The pair played alongside each other at Hemel Hempstead and Hampton & Richmond before completing moves to Fratton Park in January 2017. But while Lowe has thrived and become one of the Blues' chief attacking threats, Kabamba struggled for minutes and wasn't offered a new deal after his contract expired on June 30. However, the marksman was snapped up by the Hawks following his release - meaning he'll swiftly face his former club. Lowe is excited to face his best friend at Westleigh Park - and playfully intends to torment him on the pitch. The former Barnet talent said: 'I've never played against him so it'll be a weird one. 'We've played for three different teams together and it'll be a weird one. 'I'm going to try to get near him at one point and kick him! 'We'll be at opposite ends of the pitch but I'll try a little elbow or something to let him know I'm there. 'He hasn't had to up sticks again and he's playing at a decent level. Lowe kicked off his pre-season campaign with a goal in Pompey's 4-1 victory over Cork City on Monday night. Kabamba, however, failed to register in Lee Bradbury's side's 8-0 romp at Gosport Borough on Tuesday - despite having two opportunities from the penalty spot. Lowe revealed he's already teased the ex-Aldershot loanee about his two spot-kick misses. And he believes the clash against the National League side will be a good test for Kenny Jackett’s troops. He added: 'I spoke to him on Tuesday night. They (the Hawks) won 8-0 but he missed two penalties so I was giving him a bit of stick about it! 'He's looking forward to seeing the boys and it should be good. 'They have built on their squad signed a few players and it should be a good test.